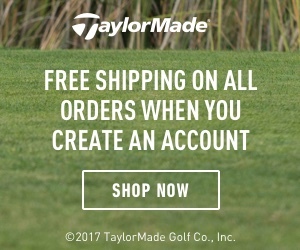 In my past articles here i have touched on a lot of great golf swing tips from driving the ball off the tee to hitting your fairway woods and long irons to the green or just to advance your ball down the fairway getting closer to the hole, to hitting your short irons from the fairway onto the green. I have also given great tips on hitting your ball out of the sand trap onto the green, and also chipping the ball from around the green to get close to the hole. Today i wanted to take some time to help you with some of my best golf putting tips. A lot of golfers, especially novice or beginner golfers seem to think that putting is just a boring part of playing an eighteen hole round of golf. Unlike the novice or beginner golfer many of the most experienced and skilled golfers that play the game actually realize that more strokes are lost or gained in an eighteen hole round of golf on the putting green. They will spend countless hours on the practice green trying to perfect their putting stroke and techniques whereas the novice golfer will show up at the golf course go do the driving range and smash a bunch of golf balls with different clubs and go to the practice green and just spend a couple of minutes putting a few golf balls in the hole from short distances and then head to the first tee. Little do they know that the exact opposite holds true, you should be spending more time on the practice green than on the driving range. 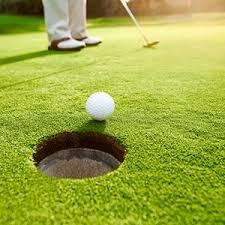 Hence, the well-known term in golf circles ( you drive for show but you putt for dough ) I bet you that most golfers do not realize that over sixty per cent of their golf shots over the course of an eighteen hole round of golf are made from the putting surface. A major part of your putting stroke is actually all about feel, and by that i mean to get the right feel for putting you will need to block out a lot of outside distractions we have in our everyday lives. Once you get to any golf course you should immediately consider the golf course your own private sanctuary. One way you can accomplish “feel for putting” is to go to the golf practice putting green and without even using a golf ball yet just grip your putter, take your stance and take a few practice putting strokes with your eyes closed, that’s right playing golf with your eyes closed. Now using a golf ball set up around ten feet from a hole that is a fairly straight putt and take your stance, grip your putter making sure you are aligned with the hole and envision your ball going into the hole now shut your eyes again and make your putting stroke striking the ball towards the hole. It seems like when a golfer finally gets on the green and it is their turn to putt, they set up and stand over their putt and then all of a sudden their arms tighten up, they grip their putter tighter and all of a sudden they have lost all feel for their putt. The best way to eliminate this problem is to constantly practice the eyes closed drill and you will be amazed how much more relaxed and comfortable you will feel standing over your real putts on the course. Practicing like this will give you different roles of the ball on each different surface but your main golf here is installing muscle memory in terms of your actual putting stroke. This will help your putting tremendously when it comes to consistency with your stroke. If you ever pay attention to any really great putters you will notice that during their entire putty stroke their heads hardly move at all, this is also important in creating a consistent putting stroke. Find a clear wall whether at home, office, anywhere, now approach the wall and take your putting stance and just touch your forehead against the wall and start taking some practice strokes, this will ingrain in your brain the feeling of your head staying still when you get on the golf course. You can also look down to your putter while you are taking these practice strokes and be sure your is putting is going back and forth along the wall seeing that your putter is moving in a straight line. One of the most dreaded terms in the world of golf is the dreaded three putt, which occurs when once you get on the green it takes you another three shots to get the ball in the hole. Rarely do you see a pro or even a seasoned golfer three putt. Do you know why? Because they practice long distance putts on the practice green. Not always will your shot to the green land close to the hole, sometimes you could be forty or fifty feet away, the key here is even if you don’t get that putt in the hole you at least want to have a short second putt to finish the hole. One way i do this is by playing a game i call golf boccie ball, the object is to take five or so white golf balls and one colored golf ball. Place the colored ball somewhere on the green, now take the white golf balls and place them different lengths from the colored ball and try to putt them as close to the colored ball as you can, this drill will also help you out in reading different breaks and undulations in the green. Most seasoned or pro golfers all have their favorite putter and will use no other, even when they would upgrade their clubs they will still keep their putter. Once a player find their go to putter they rarely change it unless they start having putting problems and feel they need a change. I, myself have had my insert faced blade putter for almost twenty years now. If you are a novice or beginner golfer and have yet to find that go to putter i would suggest you go to any golf club shop and they usually have a little putting area with all different styles of putters. Try them all until you find one that really feels comfortable to you. I would not however buy it on the spot. Get the make and model and do some research and you can more than likely get a better deal online or elsewhere. I hope you have noticed throughout this article and all the tips and techniques their is one constant. What is it? Practice, practice,practice. In order to create the most consistent and dependable putting stroke in order to shave lots of strokes off your score you need to practice. I hope you find all the information in this article very useful in making your quest for the best golf game possible. If you have found it helpful please leave a comment below or if you have any questions please feel free to leave them as well, and i will get back to you as soon as possible. Fantastic info here. Learned a lot about putters and the methods involved. I didn’t realize there were so many different putters. I need to get practicing I think! Thanks for the articles. I’m very new in the world of golf but I like the way that you’ve explained things. At least beginners can also take the courage to fulfil their golfing dreams. This is absolutely an area I need to practice, practice, practice. I have been given some great tips by other players but I think my technique leaves a bit to be desired. I am wondering if it is my head moving too much, I’ll be trying the head against the wall trick and see how I go. Thanks for the info as always, you know I’m a fan of your site, keep up with the great content. Love that saying “you drive for show, but you put for dough”, I had never heard it and it did give me a bit of a chuckle.